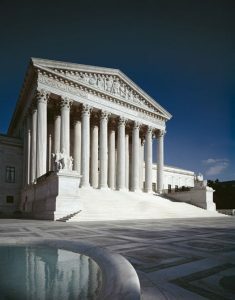 Although its earliest years are lacking formal documentation, the Supreme Court’s Page Program began sometime in the 1860s. The earliest known Page was James D. Maher, who served from 1865 to 1871, before eventually becoming the Court’s Clerk from 1913-1921. The Office of the Marshal, which ran the program, began to keep an accurate roster of former Court Pages in the 1890s and started to take group photographs of each Term’s Pages around 1913. These photographs were compiled into two photo albums that now reside with the Office of the Curator at the Court. The first album begins with some clipped photographs of individual Pages from the 1890s (John K. Ewing, Lee M. Jordan, and Frank K. Green) and 1906 (Karl Kinderberger), before moving on to the 1913 group. Each subsequent year is included and the second album ends with the final group of Pages (Daniel Robinson, Deborah Gelin, Linda Carlton, and Mark Albertson) who served during the Court term beginning in October 1973. 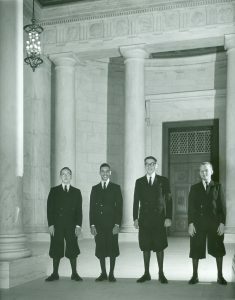 During the intervening years, the number of Pages and their entrance requirements remained the same: Four Pages, all white males until 1954; each between 14 and 17 years of age; all relatively short of height – in order to remain unobtrusively hidden behind the backs of the Justices’ chairs on the bench; and, unlike their colleagues at the Capitol, all lived with their families in the Washington, D.C. area and commuted from home. Some served for four years; some for a shorter time. Their uniform consisted of black serge double-breasted suits, white dress shirts and black neckties, black shoes – with knickers and long black stockings instead of trousers when the Court was in session and long trousers at other times when on duty. The knickers did not disappear in the official annual Court Page photos until the October Court term of 1963, long after the House and Senate Pages had abandoned them. The first African-American Court Page was Charles Bush, personally selected by Chief Justice Earl Warren during the summer following the Court’s landmark decision on school segregation in June 1954. Others followed Charles Bush. The first female Court Page was Deborah Gelin, who started with the Court term of October 1972. Tasks that all Court Pages accomplished included, on days when Court was in session, setting out quill pens for the attorneys arguing the case that day; paper, pens, ink, sharpened pencils for each Justice’s desk on the Bench; and large bottles of commercial spring water in stands behind the Bench with glasses and silver trays for water for the Justices when requested. Supplies were stored in an ante room behind the bench. As the Justices approached the Bench each morning and after the lunch recess, if needed, Pages helped them finish putting on their black robes and then, when the Crier called the Court to order, Pages held back the long, heavy drapes as the Justices proceeded together up the few steps to the Bench and to their seats. Pages also assisted as the Justices were seated. While Court was in session, the Pages sat quietly in small chairs on the Bench immediately behind the Justices and between the huge marble columns. When signaled by a Justice, they delivered notes, papers or books to and from the Justices and their offices – or each other – and brought them a glass of water or other items when requested. After a day’s session ended in the late afternoon, Pages cleaned up the attorneys’ and Justices desks, put everything reusable back into the Ante Room, changed into street clothes, and then took public transportation home for the evening. On Saturdays or whichever day the Justices’ conferences fell, one or two Pages in uniform but in later years with long pants and not knickers, waited outside the Conference Room and Justices occasionally emerged with the usual tasks to perform. Pages never entered the Conference Room or heard any of the deliberations. During weekdays when Court was not in session, Pages typically worked in the Supreme Court Law Library, assisting as directed and doing their homework when library tasks permitted. This work occasionally required walks to the Library of Congress or offices at the Capitol and the Congressional office buildings. Court Pages only worked from the first Monday in October until the Court adjourned in May or June. The school term usually began in September before work at the Court commenced and ended after the Court adjourned for the summer. Until the early 1940’s, Court Pages did not attend high school with the Capitol Pages and typically went to private night school in the city. After they were assimilated into the Capitol Page School system, which included all four years of high school, they attended school with their schoolmates from about 6:15am until 10:00am each school day. The school was located initially in the basement of the Capitol building until 1949 when the school migrated to the third floor of the Library of Congress. School curricula was heavily oriented toward college preparation since there was little time for other types of courses. 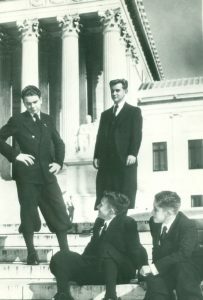 When the school day ended at about 10am, Court Pages took the short walk across the street to the “Page Room” in the Supreme Court building to change from their school clothes to the Page uniform and began their work day. The Page Room had lockers, a bathroom, and a ping pong table. Many games were played there when time and tasks permitted. Interaction with their Page colleagues on the Hill often led to interesting encounters with congressmen and foreign VIP visitors, but the Court Pages generally kept to their side of the street and remained busily engaged with Court duties. All Court Pages could not help but remain in awe of their spectacular surroundings and the privilege of being among the leaders of the Court – as well as assimilating the content of the more interesting cases being argued, at least as much as a 14-17 year old could understand! It was a financially as well as educationally rewarding event in a young teenager’s life and a unique opportunity to learn a lot about a little-understood branch of the U. S. Government.